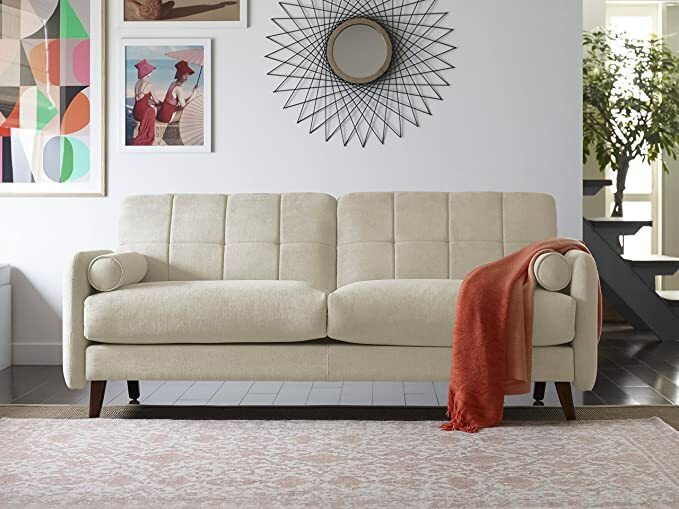 The Elle Decor Olivia sofa is a people pleaser. With distinctive details, inviting comfort and eye-catching styling, this piece will please comfort seekers, decorating divas and deal chasers alike. 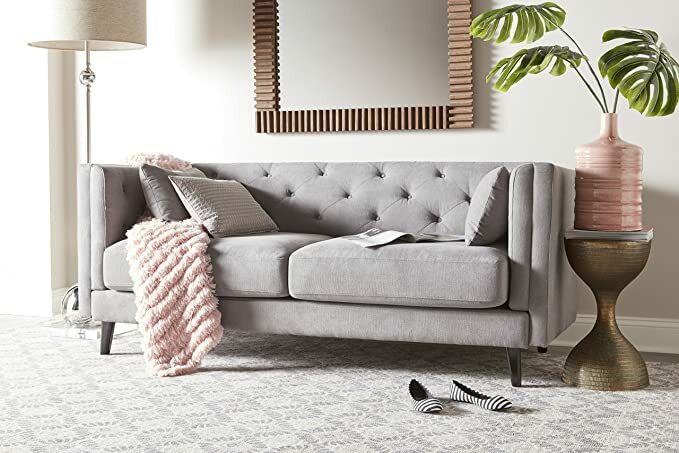 A contemporary low profile, classic high style and colors to please every taste and decor the Elle Decor Celeste tufted sofa has something for everyone and every room. And thats only the beginning this sofa is guaranteed to feel as good as it looks!. Your bedroom is your sanctuary. The place to find your Zen, the place that recharges you for another amazing day. So, lets give it the style and sophistication it deserves. 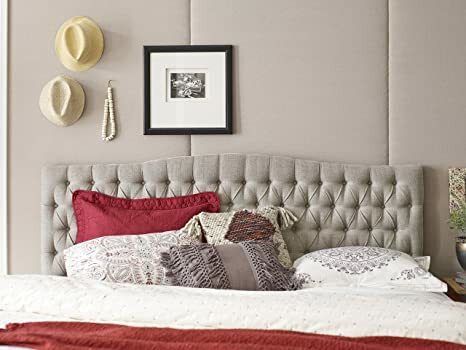 Imagine entering your bedroom and immediately feeling uplifted by the perfectly designed Elle Decor Tufted Headboard. The button-tufted tailoring is elegant and the subtle top curve makes a bold complement to the straight edges and wide board. The expertly crafted linen upholstery comes in three warm colors, gray, beige and brown. Easily fitted to a queen or king sized bed, the headboard is ready to assemble in ten minutes. With a hardwood frame, the piece is sturdy and long-lasting. You can sit back and relax with your iPhone checking the latest news as you are supported by the padded back. The headboard combines comfort and artistry at an inexpensive cost. Mid-century design meets twenty-first century aesthetics with the Chloe arm chair by Elle Decor. The Chloe arm chair has a simple square back pattern and bolster pillow to offer a vintage, yet modern feel. 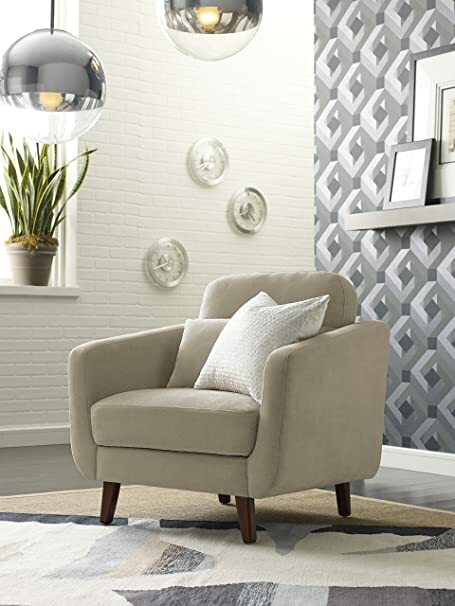 The arm chair is upholstered in rich microfiber and is available in three colors, light gray, beige, or dark gray. Measuring 24 inches wide and 24 inches deep, the Chloe is spacious and comfortable. She’s is ideal for small living rooms or offices, or buy two and create a conversation setting! 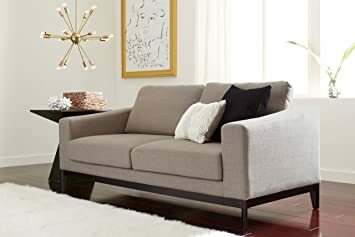 This beautiful, mid-century modern loveseat is the latest design from Elle Decor. The textured look of the square back and bolster pillows adds style and balance to any room. Measuring 61 inches wide, it is the perfect loveseat for small living spaces, including apartments and offices. We offer microfiber fabric in three beautiful colors, light gray, dark gray, and beige. Imagine how each color will look in your living space. Which art pieces will frame the Chloe mid-century modern loveseat? See it! Feel it! Now, go ahead and buy it! It’s at an amazing price, so why wait? The Amelie arm chair by Elle Decor combines practicality, comfort, and style. 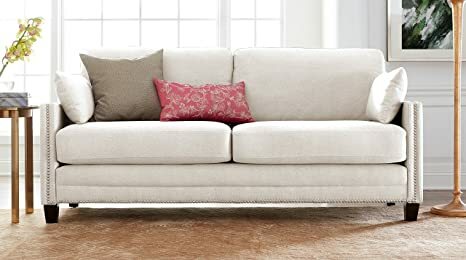 The mid-century design has a tufted solid back, flared high arms, and seamless contours for sophistication and class. The soft, durable microfiber is full of luster and comes in three attractive colors, light gray, beige, and dark gray. There is plenty of roominess with the Amelie measuring 24 inches wide and 24 inches in depth. So, sit back and relax into the plush cushion. Feel free to use the extra pillow for more of the sigh factor. Aaaahhh. Yes, thats it. Need another reason to relax? The Amelie has a hardwood construction for a solid base and lasting durability, so youre getting style AND comfort. Create an ambience with a set of arm chairs for a small living room or pair a set with the Amelie loveseat for a completed look. Hassle-free assembly takes less than 10 minutes. 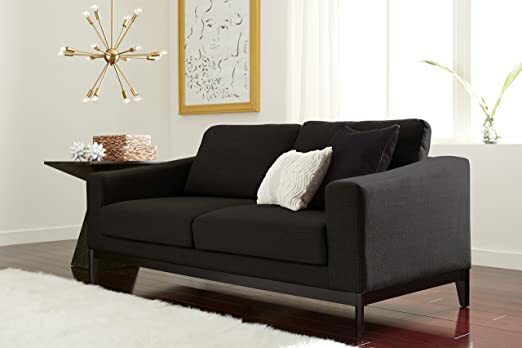 Sophistication, comfort and convenience for under $200. Dont delay the Aaaahhhness. Bella means beautiful in Italian and once you’ve experienced the comfort of the Bella Sofa from Elle Decor, you’ll be saying belle, too. 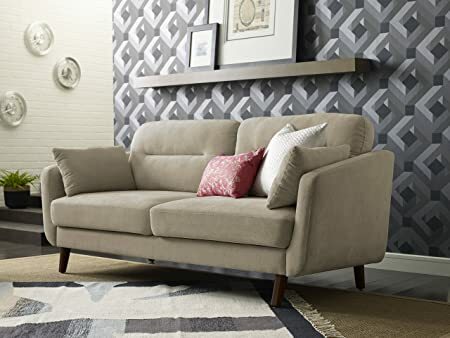 With soft cushions and plush fabric upholstery, this sofa will be the first place you land in the morning for newspaper and coffee time, and the last place you sit at night after a long day. The classy touches in this Elle Decor sofa hit the nail on the headliterally! For those extra design elements that demonstrate your great taste, you can’t go wrong with chic nail head details along the slim track arms and base. 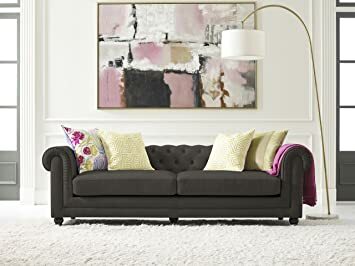 This sofa has a unique look that complements or adds contrast to any decor. So make your space a little more beautiful with the Elle Decor Bella Sofa! Guess what? The perfect style sofa has arrived. 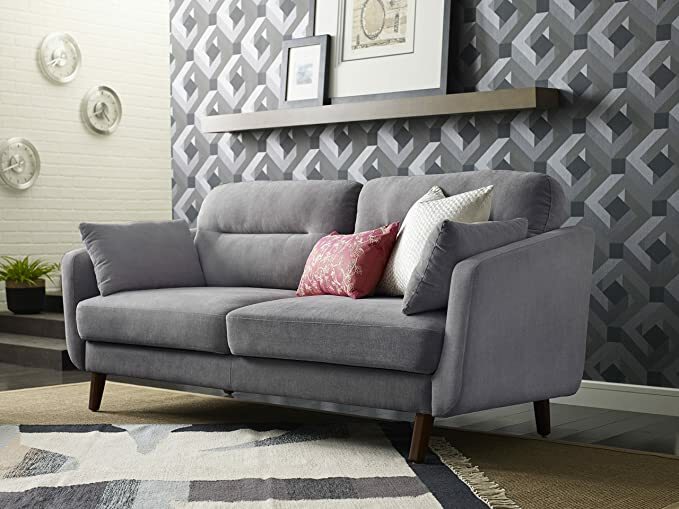 Elle Decors flagship design is called the Natalie, a mid-century modern sofa with a deep seat, perfect for must-see TV lounging. Her colors range from a calming light gray, to an inviting beige, or a sophisticated dark gray. Pick the one that matches your style best! Measuring 73 inches wide, the sofa serves as a centerpiece in a small living room or as a practical furnishing in an office or dorm. Worried about putting it together without the movers? The Natalie takes less than 10 minutes to assemble. 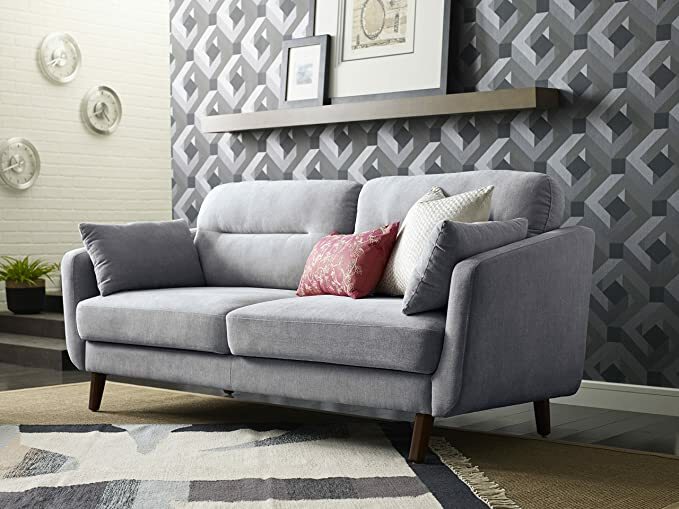 The Natalie sofa is a steal for the price, which leaves you more budget for a bigger TV! This beautiful, mid-century modern sofa is the latest design from Elle Decor. The textured look of the square back and bolster pillows adds style and balance to any room. Measuring 73 inches wide, it is the perfect sofa for small living spaces, including apartments and offices. We offer microfiber fabric in three beautiful colors, light gray, dark gray, and beige. Imagine how each color will look in your living space. Which art pieces will frame the Chloe mid-century modern sofa? See it! Feel it! Now, go ahead and buy it! It’s at an amazing price, so why wait? 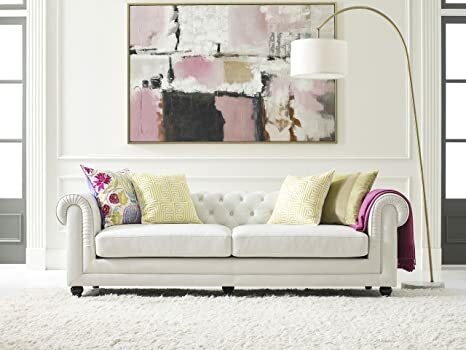 The Elle Decor amery tufted sofa offers an enticing balance of sophistication, personality, and comfort. With a variety of fabric and finishes to choose from, you can create a modern twist on a timeless statement piece and relax in a style all your own.